Spring is in the air and while that often conjures up daydreams of spring picnics and sunshine, it might also trigger some Marie Kondo style spring cleaning. And if you find yourself looking for some creative and aesthetically pleasing storage inspiration – look no further! Courtesy of the Collections Department and inspired by actual period practices, we present to you wallpapered bandboxes – cylindrical boxes of cardboard or thin wood for holding light articles of attire. In an organizational frenzy of our own, we found that we needed a creative and period-appropriate way to store some modern-day extension cords in one of the rooms in the house, to both avoid a tripping hazard for staff as well as to make the cords a little less noticeable. Cue the wallpapered bandbox. Due to the period usage of bandboxes as means of storage, modern reproduction bandboxes would fit into the furnishings while serving a practical function. In fact, we already had some in one of our furnished upstairs closets on view to visitors. So, What are Wallpapered Bandboxes? In the seventeenth and early eighteenth centuries, beaver hats were both fashionable and valuable due to their costly nature. Large quantities of beaver pelts were shipped from the Colonies to England, thus leaving a reduced supply at home for making hats. Because of their high value, men’s hats were protected when not in use, thereby necessitating a proper storage container, which gave rise to the use of the bandbox, as a hatbox. As men’s hat fashions changed to favor the tri-corner hat, so did the shapes of the hatboxes, deviating from the traditional circular shape of bandboxes. Cardboard bandbox covered with block-printed paper of green, white, and red parrots, 1820-1830. Luce Center Collection, New-York Historical Society, INV.8527. The word “bandbox” was used in New England as early as 1636, when one was recorded in the estate of Sarah Dillingham of Ipswich, Massachusetts. 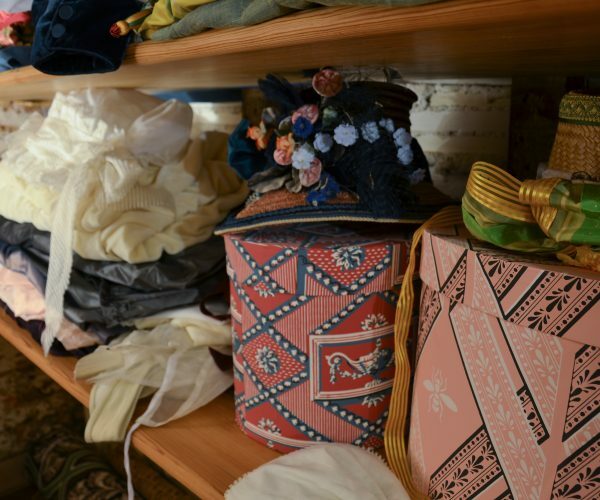 During the eighteenth century, bandboxes continued to be used as storage for men and women’s articles of clothing – remaining a popular means of storage particularly into the mid-nineteenth century, 1825-1850. 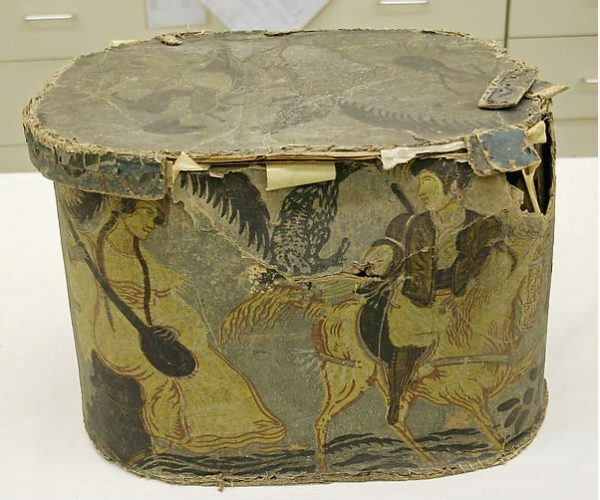 Early bandboxes were constructed with thin strips of wood, formed into the circular shape and often the bottoms would be sewn on and then covered in block-printed papers or other wallpapers, sometimes with additional painted decorations. By the mid to late eighteenth century, as the popularity of bandboxes grew, they were more often made with pasteboard rather than thin wood so to make production easier, which generated more quantity. However, since pasteboard (essentially thin cardboard) is much more perishable than wood, there are few examples left of these type of boxes. Hatbox, early 19th century. Metropolitan Museum of Art, C.I.46.80.8a, b. We created our bandboxes from paper-mâché boxes and wallpaper scraps from Adelphi Paper Hangings, in period-appropriate wallpaper patterns. Adelphi Paper Hangings specializes in reproducing period wallpaper patterns using period techniques. Click here to watch how bandboxes were made. Little, Nina Fletcher. Neat and tidy: boxes and their contents used in early American households. Society for the Preservation of New England Antiquities, 2001. As the Curatorial & Collections Collections Manager, Jenniffer works behind the scenes and beyond the ropes to provide care and maintenance for the entirety of the Montpelier Collections – both on display and off. Jenniffer is passionate about making collections and collections management accessible to the public and loves using the Collections Department Instagram account to highlight pieces of the collections.